Kentucky State Shape Cookie Cutter is handmade from a single piece of copper under the direction of Coppersmith Ray Braman. Kentucky State Shape Cookie Cutter measures 6 inches (152mm) wide and 3 inches (76mm) tall. As this copper cookie cutter is handmade, it may vary slightly in size and shape. Our collection of sturdy copper cookie cutters are each designed to be usable and durable. Under normal home use, expect this cookie cutter to last for generations. Building the most celebrated cookie cutters in America since 1984. CopperGifts item number 1790. 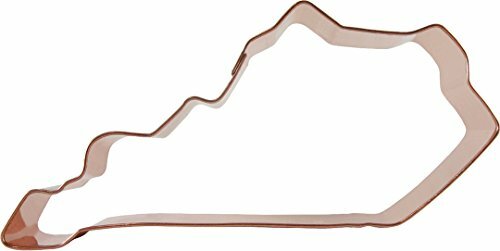 APPROXIMATE WIDTH: 6 inches (152mm) APPROXIMATE HEIGHT: 3 inches (76mm) ELEGANT 100% COPPER: Handmade in the USA from timelessly beautiful solid copper, this cookie cutter is a work of exceptional quality and durability. 1500+ SMART DESIGNS: CopperGifts Workshop is proud to offer a selection of our handmade copper cookie cutter collection on Amazon. UNSURPASSED QUALITY: Apart from the actual bending of each cookie cutter, each of our cookie cutters undergo a 15-step manufacturing process overseen by our Coppersmith Ray Braman.